Romania is known for its hospitality. Moreover play Bread and Salt an important role. Florin Catalin describes it shortly “Hospitality rituals, Bread, Salt”. The pictures show how bread baking rituals were practiced in the Technical Gymnasium “St. Ioan de La Salle”, Pildesti as the pupils welcome the guests by the schoolmaster meeting in November 2015. In Romanian tradition bread and salt play a crucial role. The bread, ancient symbol of life, and the salt, “mother of God” as it is called in the peoples’ sayings, were for Romanians, two elements with sacred significance. According to historians, the first evidence of this ritual of hospitality are pre-Christian and offering bread (initially were grains of wheat) and salt was a sign of accepting those who visited someone’s house or land. Bread and salt also stand for a lot of other beliefs and customs. The most famous ritual that includes both remained that of welcoming guests with bread and salt as a sign of love, kindness and humanity. Bread is the daily food and salt is the flavor of the food and therefore both are important in human nutrition. Also, bread (wheat) symbolizes the field’s wealth and salt was the true gold of antiquity, being, for millennia, the most expensive item of commerce. Therefore, welcoming guests with bread and salt emphasizes the Romanians’ hospitality, kindness, joy to welcome guests and treat them as friends. Another use known to Romanians is the wedding ceremony when the young couple is welcomed by the groom’s parents with bread and salt symbolizing prosperity for the grooms, but also the parents’ joy who welcome the young couple in the family. Generally, important guests are greeted with bread and salt. 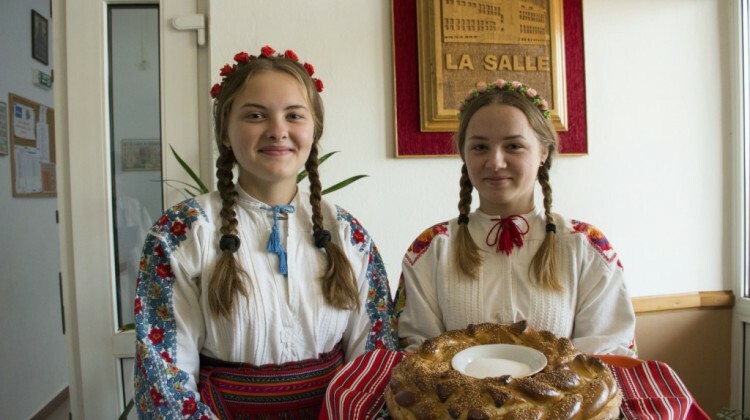 Usually, they are greeted by girls dressed in traditional costumes that have in their hands a round braided bread and a container of salt. We also use this tradition in our school and we welcome important guests with these primordial meaningful elements.